Sourav Ganguly made his farewell series memorable, notching up a century, his first against Australia. Stand-in skipper Mahendra Singh Dhoni failed to convert his maiden Test half century against Australia into a hundred, losing the mark by a whisker. Sourav Ganguly stuck to his guns, stating unambiguously that his decision to retire after the current series was final. “I do not want to play any more. Except for the tour against Sri Lanka, I had two excellent years for the country. Dwindling crowds at the Test venues was a serious matter and the ICC was concerned about it. This was disclosed by the ICC chief executive officer Haroon Lorgat here today. “When I came to the PCA Stadium yesterday, I was privileged to see Tendulkar create history. But unfortunately, stands were largely empty. There were not many people to see the history being made. Three-wicket hauls by Tuffey and Hall enabled Chandigarh Lions to beat Chennai Superstars by eight runs in the tenth match of the ICL 20s Indian Championship at the Sardar Vallabhbhai Patel Stadium, Ahmedabad, tonight. Possession pays, when patience plays. True to the word, Mahindra United (MU) kept the ball in their control till the very end and made JCT pay, as they defeated them 1-0 at the Guru Nanak stadium in Ludhiana here today. Local outfit Air India continued their unbeaten run in the ONGC I-League as they recorded their second victory in the fourth round of the competition with a 1-0 verdict over promoted Kolkata side Chirag United Sports Club at the Cooperage football ground here today. Hosts India shed their tag of poor performers at Olympic sports and pulled of a major upset at the Commonwealth Youth Games that concluded here today by topping the standings with a rich haul of 76 medals. The inaugural match of the Indian Oil Servo Surjit Hockey tournament between Punjab Police Jalandhar and South Central Railways Secunderabad ended in a goalless draw here at Olympian Surjit Hockey Stadium, Burlton Park, this evening. Host Haryana will field a strong 39-member team in the 57th All India Police Games (wrestling cluster) to be held at Madhuban (Karnal) from October 21 to 25. The wrestling cluster comprises sports disciplines in wrestling, judo, boxing, weightlifting and gymnastics. The batsmen were complimented well by bowlers as India finished day two of the second Test against Australia at the Punjab Cricket Association Stadium here on a satisfactory note today. While Ganguly scored 102, Dhoni was unlucky to be dismissed at 92, as India put up a commendable 469 on the board. Australia were off to a disastrous start. Losing key scalps at crucial moments, the Australians were reduced to 102 for 4 at close. Though Zaheer and Ishant bowled well to inflict the initial damage, it was debutant leg-spinner Amit Mishra, who set the Australians back by his twin strikes that thrust the visitors into a situation where they face the daunting task of averting the follow-on. While Matthew Hayden had no clue to a Zaheer delivery when he was bowled comprehensively, Ponting was done in by Ishant, his tormentor during the recent away Test series in Australia. Ponting was taken aback by the sharp in-dipper from the lanky fast bowler, who bowled a lively spell. The ball darted in to strike the Australian skipper on the pads and the dreaded finger of the umpire - Rudi Kortzen in this case - went up as Ponting took a while to begin his march towards the pavilion as the visitors were reduced to 17 for 2. It was, however, Mishra who did the damage. He was not overawed by the prospect of bowling to Australian batsmen on his debut on the second day track, which is not known to help spinners. Spur on the target right from the beginning, he kept the batsmen guessing with his deliveries which gained enough turn. First he flummoxed Simon Katich with a delivery that found the gap between the bat and the pads to disturb the bails. Mishra returned towards the fag end of the day for the second spell and claimed the prized scalp of Clark off what turned out to be the last delivery of the day to leave Australians tottering. Clark contributed 23. Mishra finished the day with a satisfying figures of 8.5-1-21-2. Michell Hussey survived on a couple of occasions when thick edges off seamers in the cordon between wicketkeeper and the first slip went abegging. The left-handed batsman finished the day unbeaten on 37. Earlier, a stubborn Ganguly proved a thorn in the Aussie flesh and successfully stonewalled all Australian efforts preventing them from making further inroads into the India innings after the fall of nightwatchman Ishant’s wicket. While Ganguly successfully blocked whatever was hurled at him, Dhoni was willing to take the lead and played some lusty hits. The wicketkeeper-batsman pulled and drove with elan to keep the scoreboard moving. He sent Siddle soaring over the fine leg area for a mighty six and then dispatched Lee twice for two boundaries in the same over. A sedate Ganguly added just 37 runs to his overnight score of 54 to reach 91 at the lunch break. The left-handed batsman did not take too long to complete his century, his 16th in his 111st Test. His 102-run knock included eight hits to the fence. Continuing in the same vein, Dhoni struck his trademark shots. He was unlucky to miss out on he three-figure mark falling lbw to Siddle when he was batting on 92. He hit eight fours and four sixes during his 124-ball stay at the wicket. The visitors will be pinning their hopes on Hussey to come good once again if they have to stay alive in the match. 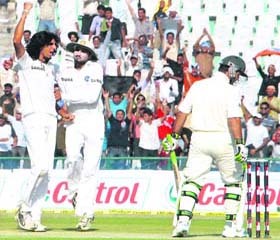 Bowling: Zaheer Khan 13-4-24-1, Ishant Sharma 9-3-28-1, Harbhajan Singh 10-2-28-0, Amit Mishra 8.5-1-21-2. Sourav Ganguly stuck to his guns, stating unambiguously that his decision to retire after the current series was final. “I do not want to play any more. Except for the tour against Sri Lanka, I had two excellent years for the country. But, despite this form, I will stick to the decision,” Ganguly, who scored his maiden Test century against Australia and the 16th overall, stated emphatically today. The left-handed batsman was replying to queries whether his current form would prompt him to change his decision to quit international cricket. The elegant batsman, who yesterday achieved a major landmark when he completed 7,000 Test runs to join a select band of Indian batsmen like Sunil Gavaskar, Rahul Dravid and Sachin Tendulkar, categorically denied that he did not take the retirement decision under any duress. He also denied that he was a victim of circumstances. “It was a personal decision,” he said. Quizzed about the sedate nature of his knock, Ganguly replied, "It was not easy scoring the boundaries. There was not much gap in the field employed. They had people saving the boundaries." “Peter Siddle was quite sharp. I have faced him earlier in Australia. In fact, all the Aussie quicks bowled well touching 140 kmph or more. If he (Siddle) bowls in Australia, he will be even more effective because pitches there aid pace bowlers,” Ganguly replied when asked by Australian scribes how he rated the debutant seam bowler. Dwindling crowds at the Test venues was a serious matter and the ICC was concerned about it. This was disclosed by the ICC chief executive officer Haroon Lorgat here today. “When I came to the PCA Stadium yesterday, I was privileged to see Tendulkar create history. But unfortunately, stands were largely empty. There were not many people to see the history being made. We will have to look into the matter, which is very serious” Lorgat said. The first day of the second Test saw Tendulkar overtake Lara as the highest run-getter in Tests. Ironically, barring a couple of hundreds of schoolchildren in stands, there were hardly any fans to witness the landmark being made. Lorgat said though spectator response during the first Test at Bangalore was better, but the decreasing crowd support for the longer version of the game was a matter of grave concern and the ICC would surely look into it. Regarding the vexatious issue of ICL’s dispute with the BCCI, Lorgat said a meeting was held between the officials of the ICL and the BCCI. “It is for them to sort out the matter. As for the ICC, we are waiting a formal reply from the BCCI,” he said. "We still have time before the start of the series and the issue is being dealt by the respective boards. I'm sure BCCI would also support them," he added. “The ICC is a member of the IOA. The sole question was whether we want to participate in the Olympics or not in view of the already overcrowded international calendar,” Lorgat replied when asked about the participation of cricket in the Olympics. Put into bat, Lions made 163 for 8 in their 20 overs. Dinesh Mongia top scored with 47 runs (29 balls, 8 fours, 1 six). Superstars’ Hayward scalped four wickets. In reply, Chennai Superstars only managed to make 155 runs. Bowling: Hall 4-0-23-3, Tuffey 4-0-13-3, I Malhotra 3-0-38-1, Ablish 4-0-36-0, Mongia 4-0-30-0, TP Singh 1-0-14-0. Player of the match: Tuffey (Chandigarh Lions). JCT, who were without their talismanic striker Eduardo da Silva and first-choice mid-fielder Baldeep Singh jr looked a tad jaded right from the start. Pawan Kumar came in for the injured Edu and Amandeep Singh got a start too. The match started with both teams trying to feel their way into the game. But JCT custodian Karanjit was pressed into action straight away when in the fourth minute, Pierre broke away from the off-side trap and took a stinging shot at the goal. Karanjit somehow managed to parry away the ball. But JCT soon hit back with Baljit Sahni, who was fabulous throughout the game, with a sensational attack from the right wing. Baljit made a solo run, leaving the MU defenders flat-footed. But their was not much purchase on his low cross and the keeper made a comfortable save. The home team hit back again in the 22nd minute as Baljit's cross found Balwant but the MU keeper Subhashish tipped away the header. The first half ended in a stalemate and both teams had little to cheer about as their were little or no chances towards the end of the half. Both teams came out in the second half with some kind of a resolve. But it were the visitors who struck in the 53rd minute through Sukhwinder Singh. He was at the end of a cross and struck a clinical shot from the outside of his boot that beat Karanjit and hit the back of the net. The visitors were looking the sharper side and another goal too looked ominous. In the 57th minute, Chidi slipped away from the JCT defence but shot wide from close range. Again in the 73rd minute, Sushil Kumar's header beat Karanjit, but was obstructed by the cross bar. The attack seemed to wake JCT from their slumber and they regained a bit of their shape. Harvinder got on to a through ball and charged towards the MU goal only to lose his footing and be dispossessed by Subhashish. JCT had chances towards the end of the game and their stand-out player, Amandeep Singh took a shot from the right wing, but Subhashish again came to his side's rescue. The resulting corner presented Harvinder with a chance and the forward lashed a ferocious volley that hit the cross bar. In the 90th minute the crowd erupted when Jagpreet headed past Subhashish. But the frenzy was short lived as the assistant on the near side ruled Jagpreet to have fouled the MU keeper. There was a lot of protest from JCT's coach Sukhwinder but the goal stood cancelled, ending JCT's unbeaten start to the season. The only goal of match, which was bereft of goalmouth thrills in the first half and became a bit rough towards the end, was notched by AI medio Surojit Roy in the 71st minute of the match. Roy, coming into the fourth round tie with two goals under his belt, added one more to the tally by deflecting in a long throw-in from Uttam Singh on the right to break the deadlock midway through the second half. Kolkata: A brace by striker Yusif Yakubu guided East Bengal to return to victory path defeating Vasco Sports Club Goa 2-0 in their fourth round match of the ONGC I-League at Yuba Bharati Krirangan here tonight. Showing a marked improved performance at a time when the International Olympic Committee president Jacques Rogge was present, India bettered their last edition’s medals tally by leaps and bounds wrapping up the seven-day extravaganza with 33 gold, 26 silver and 17 bronze. Last edition's champions Australia finished on the second spot with 24 gold, 19 silver and 22 bronze, while England with 18 gold, nine silver and 14 bronze secured the third spot. India had to settle for a silver and a bronze on the concluding day of the CYG which saw only boys and girls singles finals and third place play-off in tennis being played. Yuki Bhambri earned India the first medal - a bronze - on the concluding day when he beat Logan Mackenzie 7-5, 6-2. In the second match, Punjab and Sind Bank registered an impressive 4-0 win over BSF, Jalandhar. The match between the bank team and BSF was a one-sided affair. The bank team scored goals at will and had established the lead in the sixth minute of first half. Vikramjit Singh opened the account for bankers through a penalty corner. His straight hit sounded the board. The second goal was scored by Parminder Singh. Their third goal came from the stick of Ranjodh Singh. He dodged past the opponents to score a field goal. Their last goal was scored by Daler Singh. Host Haryana will field a strong 39-member team in the 57th All India Police Games (wrestling cluster) to be held at Madhuban (Karnal) from October 21 to 25. The wrestling cluster comprises sports disciplines in wrestling, judo, boxing, weightlifting and gymnastics.